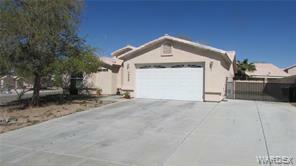 Beautiful Home located in Fairway Estates on large corner lot with RV Parking. This home has a great floor plan with vaulted ceilings for a nice open feel throughout the home. Nice open kitchen with island and ample storage. Great master bedroom with large, lovely master bathroom with dual sinks and walk-in closet. This Fabulous community offers golf, Community center, pool, tennis courts and more! Don't miss out on this great home and view today!